Random thoughts about cool stuff. My wife was excited when I told her I was writing a blog post about relationships. Then I read her the title, and she wasn’t so excited anymore. Hopefully some of you photo geeks will be. I think I finally wrapped my mind around flash high speed sync speeds and how it relates to focal plane shutters used on modern digital SLR’s. I will try to explain. I’m talking about how your digital SLR camera restricts you to using lower shutters speeds (for example, below 1/250 of a second) as soon as you enable your flash/strobe. The exact max sync speed depends on the camera, but unusually it’s around 1/200, 1/250, or 1/500 of a second. This can be a bummer when you’re shooting outdoors and wanting to use your camera as fill light, especially at large apertures. Often the only way to get a proper exposure is to use a small aperture, which isn’t always desirable. I used to always wonder why this was an issue, since your flash puts out a super short burst of light (anywhere from 1/1,000 of a second to 1/50,000 of a second). With the pulse of light usually being shorter than even a “fast” shutter speed, it didn’t make sense to me why I couldn’t use that faster shutter speed. There should be enough time for the flash to light the scene. You’ll notice (after the mirror bounces out of the way) that there are 2 curtains. In order to achieve a fast shutter speed, one curtain opens, and the next one follows along before the first one has finished, exposing part of the sensor in a moving “band.” This two-curtain design is needed because the curtain can’t move fast enough to achieve the higher shutter speed on it’s own. Using both curtains in tandem causes the sensor to be exposed for a shorter duration which is what you are trying to achieve when you tell the camera you want a fast shutter speed. So then we can see why a normal flash burst of light doesn’t work at these higher shutter speeds: at any given moment when the flash fires, only part of the sensor is exposed as the curtains move across the sensor. This means that the flash would not expose the whole scene. The solution to the problem is to change how the flash fires when using these faster shutter speeds. Instead of one quick burst of light that is shorter than the shutter speed (normal operation), the flash outputs a continuous beam of light by pulsing thousands of times per second. Basically, the flash outputs light throughout the entire duration of the curtain movement to insure that the light from the flash hits the entire sensor. This comes at a cost of losing about 1 stop of light. But it’s still a big advantage to be able to use the flash at these higher shutter speeds. Canon calls this High Speed Sync and Nikon’s calls it Auto FP High Speed Sync. 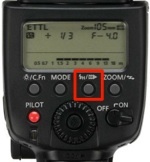 Both effectively allow you to use your flash at any shutter speed. The great thing is that you can enable this feature on your shoe-mounted flash, and it will only use it when it needs to. As far as I know, it’s not available on built-in flashes.So there you have it. A (mostly) simple explanation of high speed flash sync, and how it relates to the focal plane shutter on your digital SLR. If you’re interested, check out this article for more details. Also, here is an even more nerdy sequence of photos showing the shutter release on a Nikon D3. Get more out of this post by commenting and keeping track of it using these online tools. Search Ikan Awesome archives by month using the list below. Search for posts using the search form or by selecting a keyword from the list below. Take a second and visit these other great sites from around the Web. Powered by WordPress and Victoria (a DP Shiny mod). © Copyright 2006 Ikan Awesome.